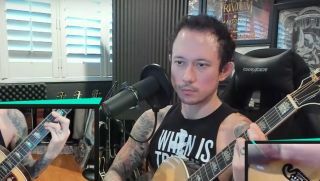 Trivium's Matt Heafy Shares Acoustic Cover of Killswitch Engage's "My Curse"
Heafy offers thanks to former Killswitch frontman Howard Jones for filling in for him on tour. Trivium Share Official Video for "The Wretchedness Inside"
The band's North American tour with Avatar and Light the Torch begins this week. The singer and guitarist has also covered Britney Spears, Celine Dion and more. As part of our 2014 Summer Tour Survival Guide, we talk to Matt Heafy of Trivium about the sweatiest show he's ever played, and the gear he'll be using on this summer. This video is bonus content related to the April 2014 issue of Guitar World. For the full range of interviews, features, tabs and more, pick up the new issue on newsstands now or at our online store. Duff McKagan Premieres New Track, "Don't Look Behind You"